Sale on accessories for motorcycles, save on all motorcycle accessories. Low prices motorcycle on accessories, Motorcycle Gear Superstore. We provide the best accessories for riders and their motorcycles. Welcome to the worlds most popular motorcycle accessories web site. We provide the best accessories for riders and their motorcycles. We are the number one stop for all your motorcycle accessories needs. Free shipping on all motorcycle accessories that meet the minimum price guarantee. Motorcycle accessories, parts and tires are needed to help maintain and keep your bike and keep it functioning properly. Maintain your bike by selecting the right motorcycle accessories and accessory parts to get the job done. Accessories for motorcycles and riders, shop and save on all motorcycle accessories, accessory parts and biker accessories. If your looking to spices up your ride or your outfit, we have the best deals around with some of the cheapest prices. How to select the right accessories for motorcycles. When selecting accessories for motorcycles, the main consideration should be the style of the bike. 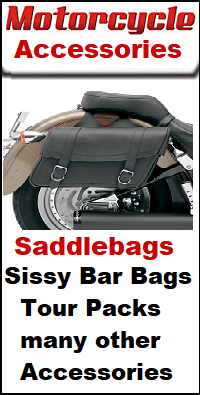 Some bikers choose to add a little style to their bike bay adding an accessory like saddlebags or a cup holder. Accessories come in many different styles and if they don't match your bike, it will make your ride look out of place. The best advice when selecting accessories or accessory parts for motorcycles is to make sure they match the type of bike you are riding. All our accessories, come with a 30 day unconditional return policy. Just return any accessories, within 30 days and we will grant a full refund.